Please give us your vote, thank you. After voting click on back to return to this site. The tragedy of the conflict between Isreal and Palestine are that both are equally innocent and both are equally guilty. Here are few examples of guilt on both sides. On the Isreali side: A large contribution of the formation of the Isreali state was done by two terrorists organizations, the Irgun Zvai Leumi and the Lohamei Herut Isreal (Lehi or Stern Group). During the Isreali War of Independence, the Irgun massacred the people of Deir Yassin. The slaughter of 245 men, women, and children lead to the massive flight of Palistinians to other countries. The Isreali government did not crush the Irgun and Lehi for this horrendous act. Only after a showdown over the delivery of arms to the Irgun during the First Truce did the Isreali government hunted down and forced the disbandment of these two terrorists groups. The terrorists organizations that have lead assualts on innocent Isreali children commonly use villages, schools, hospitals, and mosques as human shields. Rather than using ground troops and the Mossad to strike these groups directly, the Zahal instead in the past have bombed these targets and killed the human shields around them, causing more hatred for Isreal. During the Isreali invasion of Lebanon, the Zahal (IDF) allowed the Phalangists militia to invade the Palistinian refugee camps of Sabra and Shatilla in Beruit and massacre innocent Palistinian men, women, and children. On the Palistinian side: The PLO was created in 1963 to liberate Palistine from occupation but the PLO never once commited a terrorist act against the Jordanian occupation of the West Bank or the Egyptian occupation of the Gaza Strip. Now you have to ask youself what part of Palistine were the PLO trying to liberate? In 1970, Yassar Arafat and the PLO tried to assasinate the King of Jordan and launch a coup to overthrow the Jordanian government leading to the civil war in Jordan and the expulsion of the PLO to Lebanon. 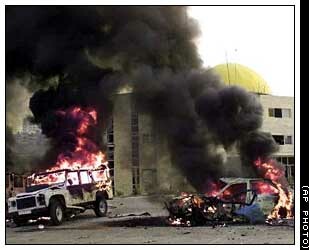 This attempted coup lead to the deaths of many innocent Jordanians and Palistinans caught in the crossfire. Instead of attacking either the Isreali government or the Zahal, the PLO has deliberately tageted and murdered innocent Isreali children from the beginning. A classic example is when three members of the PLO seized an elimentary school in Mal'lot, Isreal on May 3, 1974 and used children as human shields in a gun battle against Isreali police, causing the deaths of 25 children. In the last year of the Intifada, the Palistinian Authority has turned a blind eye to Hamas, Islamic Jihad and Hezbellah operating in its territory and allow almost daily terrorists attacks to occur against innocent Isrealis such as the recent attack that occured at Elias Sinai settlement where Palistinians killed two Isreali children and then tossed grenades into the homes of innocent children. The so called Palistinian refugee camps are the ghettos of the Middle East. Every Muslim government that have these camps have stripped the civil and economic rights of all Palistinians and treat them as scum. The best example is Lebanon where Palistinians are forced to live in seventeen ghettos and are stripped of even the right of repairing their homes. If a toilet breaks in a Palistinian house in Lebanon, any Palistinian that tries to repair or replace a broken toilet risks being tortured and imprisoned by the Lebanese government. 117 professions in Lebanon such as doctor, lawyer, engineer, and architect are denied to Palistinians and they are only allowed to do manual labor. Every Muslim must rise up and demand equal civil and political rights for Palistinians as fellow Muslims. It is pathetic that only in the Palistinian Authority, the United States, and ISREAL are Palistinians given equal economic and civil rights. Right now the United States is the home not only to approximately 25 million Jewish-Americans but also the home to nearly 600,000 Palistinian-Americans. If Jewish and Palistinian Americans can live in peace, so can eventually Isreal and Palistine. "The British chose to call the land they mandated Palestine, and the Arabs picked it up as their nation's supposed ancient name, though they couldn't even pronounce it correctly and turned it into Falastin a fictional entity." Keep in mind that the Arabs control 99.9 percent of the Middle East lands. Israel represents one-tenth of one percent of the landmass. But that's too much for the Arabs. They want it all. And that is ultimately what the fighting in Israel is about today . . . No matter how many land concessions the Israelis make, it will never be enough. From the end of the Jewish state in antiquity to the beginning of British rule, the area now designated by the name Palestine was not a country and had no frontiers, only administrative boundaries . . . . The land was empty, neglected, abandoned, desolate, fallen into ruins. Nothing there [Jerusalem] to be seen but a little of the old walls which is yet remaining and all the rest is grass, moss and weeds. The country is in a considerable degree empty of inhabitants and therefore its greatest need is of a body of population"
There is not a solitary village throughout its whole extent [valley of Jezreel] -- not for 30 miles in either direction. . . . One may ride 10 miles hereabouts and not see 10 human beings. The restoration of the "desolate and unlovely" land began in the latter half of the Nineteenth Century with the first Jewish pioneers. Their labors created newer and better conditions and opportunities, which in turn attracted migrants from many parts of the Middle East, both Arabs and others. The Balfour Declaration of 1917, confirmed by the League of Nations Mandate, commited the British Government to the principle that "His Majesty's government view with favour the establishment in Palestine of a Jewish National Home, and will use their best endeavors to facilitate the achievement of this object... " It was specified both that this area be open to "close Jewish settlement" and that the rights of all inhabitants already in the country be preserved and protected. British policy was to curtail their numbers and progressively limit Jewish immigration. By 1939, the White Paper virtually put an end to admission of Jews to Palestine. This policy was imposed the most stringently at the very time this Home was most desperately needed -- after the rise of Nazi power in Europe. Jews who might have developed the empty lands of Palestine and left progeny there, instead died in the gas chambers of Europe or in the seas they were trying to cross to the Promised Land. Casual use of population statistics for Jews and Arabs in Palestine rarely consider how the proportions came to be. One factor was the British policy of keeping out Jews while bringing in Arabs. Another factor was the violence used to kill or drive out Jews even where they had been long established. For one example: The Jewish connection with Hebron goes back to Abraham, and there has been an Israelite/Jewish community there since Joshua long before it was King David's first capital. In 1929, Arab rioters with the passive consent of the British -- killed or drove out virtually the entire Jewish community. "There is no such country as Palestine. 'Palestine' is a term the Zionists invented. . . . Our country was for centuries part of Syria. 'Palestine' is alien to us. It is the Zionists who introduced it." "There is no such thing as Palestine in history, absolutely not"
"It is common knowledge that Palestine is nothing but southern Syria." During those 19 years, 1948-1967, Jordan and Egypt never offered to surrendar those lands to make up an independent state of Falastin. The "Palestinians" never sought it. Nobody in the world ever suggested it, much less demanded it. Finally, in 1964, the Palestine Liberation Movement was founded. Ahmed Shukairy, who less than 10 years earlier had denied the existence of Palestine, was its first chairman. Its charter proclaimed its sole purpose to be the destruction of Israel. To that end it helped to precipitate the Arab attack on Israel in 1967.